Security, privacy, and access control are essential for both residential and commercial properties alike. Gates can fulfill these functions while enhancing a property’s curb appeal. However, not just any gate will do—it is important that a gate accentuates the style of the building and surrounding property and suits the owner’s needs and budget. With over ten years of experience creating fencing and gate solutions, DCS Industries offers a variety of options to enclose any property. We feature several series of gates in styles ranging from simple and budget-friendly to decorative and ornate. The Mesa Gate Series is an appealing median that offers sleek, understated elegance. The hallmark of gates in the Mesa Series is a stylish, gentle arch. They are made mostly from high-quality composite wood in either a rustic cedar or redwood style. The composite wood gives the gates a rich appearance while offering the advantage of being very low maintenance. Mesa Gates are framed with beautiful wrought iron available in a variety of colors, from Navajo white to tan to textured or glossy black. As with all other wrought iron products from DCS Industries, framing on the Mesa Gates is made from premium-grade steel and carries the option of galvanization—which adds a protective zinc coating—for at least twenty guaranteed years of rust-free durability. In addition to boasting a stylish look that will enhance the appearance of any property, Mesa Gates offer excellent functionality for reliable privacy and security. 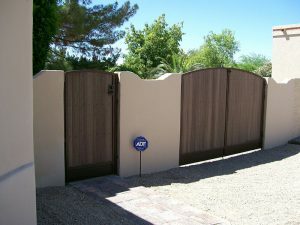 Privacy strips ensure that passers-by cannot see through the gates into enclosed areas of the property. Various latching mechanisms, ranging from a thumb latch to a double lock box, are available to meet the safety and security needs of the property owner. 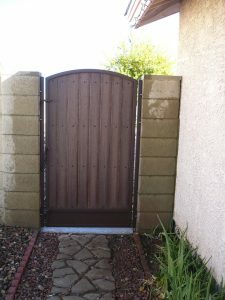 Due to the quality of the wrought iron components, owners can be assured that Mesa Gates will open and close properly for years, even as they are exposed to intense sun, heat, and rain. Designed, manufactured, and installed by the experts at DCS Industries, Mesa Gates promise long-lasting privacy, security, and style. Upon installation, we will ensure that all components of the gate are functioning optimally and the appearance suits the surrounding property. Call DCS Industries today at 623-825-7700 for more information on gates in the Mesa Series or to request a free estimate!